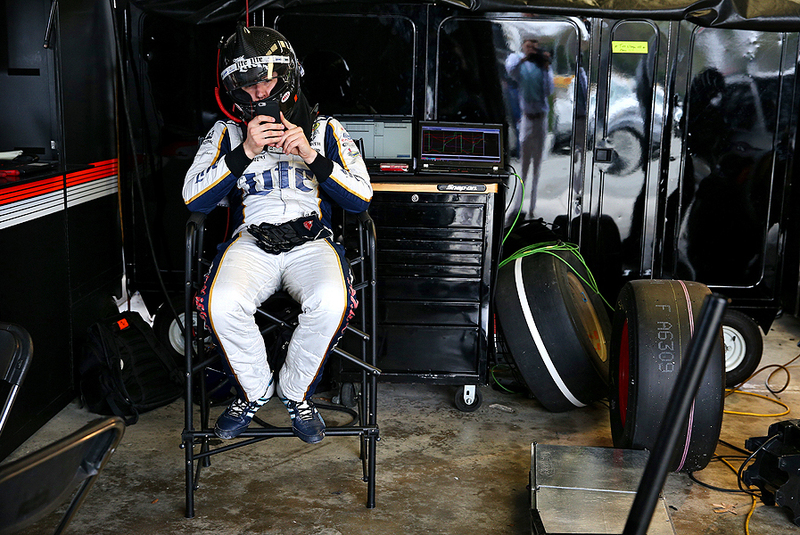 "Brad Keselowski, driver of the #2 Miller Lite Ford, looks at his cell phone as crews work on his car in the garage area during the NASCAR Sprint Cup Series open test in preparation for the Toyota Owners 400 at Richmond International Raceway on April 8, 2015 in Richmond, Virginia." Every day type of moments hold a lot of value to me as a photographer. As chaotic of a day testing a race car on a track can be for seven hours straight, the moment the driver can get to decompress is important to telling the story of the day. Brad Keselowski, driver of the #2 Miller Lite Ford, needed to step away from the car and I loved the simplicity of the image. No need to remove his helmet or unzip his track suit to respond to a text, watch a video or do whatever he was on his cell phone. To most viewers, this is another glimpse of a race car driver playing with his phone. To a photographer, it's part of history. I always try to think how a picture will be viewed in years to come. In today's world, technology is rapidly changing. The devices we use every day such as cell phones will continue evolve, change. It was also a bit symbolic to myself on a personal level, because all it took was a ring on my cell phone alerting me to come home and be present to watch my son come into the world on the very same day, just hours after this image.